When water seeps from the floor, it means the drainage to the house was not properly done. It also means the foundation of the building is faulty. 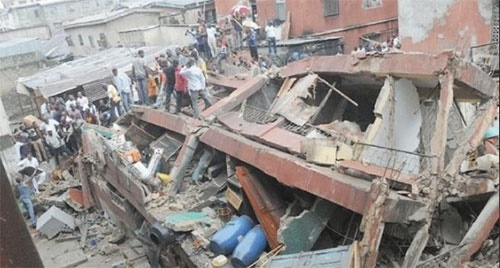 Incidences of building collapse is rife in Nigeria. Just last week, no fewer than 20 people including innocent children lost their lives when a building housing a school collapsed in Ita Faji Lagos. The Ita-Faji incident is even painful because it has been marked for demolition since 2018 but out of greed and sheer negligence, the authorities failed to do their job. The incident is highly regrettable, but it also shows why you must begin to conduct thorough checks on any building you intend to rent or even purchase. Here are 5 signs that the building you are considering for purchase or rent has serious structural defects and risks possible collapse in the future. 1. Crack in the Wall: Let’s you are considering renting a bungalow, you need to inspect it to ensure that there is no crack in the building. Cracks from the foundation to the roof of the building are quite dangerous. “Bottom up cracks is structural cracks; meaning that there is a problem with the foundation of the building; and it means the foundation has not settled,” said an Architect, Mr Amos Alao. 2. The Building Vibrates When You Slam The Door: If the entire structure vibrates when you slam the door, you should be worried. If it is a bungalow, vibration shouldn’t be common when you slam your door due to its size. And therefore vibration implies that there is a problem with the building. 3. Doorknob Shocks During Rainy Season: According to Architect Alao, “If during rainy season, a key touches a doorknob, burglary proof or any metal and it shocks you, it means there is a static electricity in the building. It also implies the building has no lighting conductor”. Alao said that therefore it was better to search for an apartment during the rainy season so as to enable the occupants to know the state of the building. 4. Water Seeps Through The Floor: “When water seeps from the floor, it means the drainage to the house was not properly done. It also means the foundation of the building is faulty,” said Alao. “A seeping floor could also mean there was no Down Proof Covering (DPC). After the construction of the floor, nylon is usually placed to prevent water from coming up. “When the DPC is not properly done or completely absent, then water will seep through the building floor and in the long run, weaken the foundation of such building,” he explained. 5. Tiles Crack When You Pound Yam: The building expert also said that a sign to watch is the cracking of tiles when you pound a yam in your kitchen for instance. This, he said, is a sign that there is a problem with the building. 6. Hearing Distinct Signs From Flat Above or Below You: This applies to those renting out a duplex or storey building. According to the expert, “if you can hear the noise from the flat above you distinctly, the building has a problem. It means that the decking over you has a porous cavity”. You should also be wary if the building gets swayed by a gusty wind. 7. Frequent Issues With Plumbing: Perhaps you now share the apartment with your plumber due to frequent plumbing issues, and you have started wondering if it is due to your carelessness. Well, it is a sign that the building has major structural defect. “When you see patches of spirogyra due to plumbing issues or the water from the flat above you leaks into your apartment, the building also has some problems you have to be wary about,” the architect said.